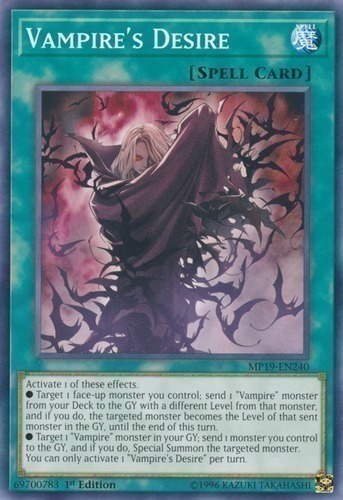 ● Target 1 face-up monster you control; send 1 "Vampire" monster from your Deck to the GY with a different Level from that monster, and if you do, the targeted monster becomes the Level of that sent monster in the GY, until the end of this turn. ● Target 1 "Vampire" monster in your GY; send 1 monster you control to the GY, and if you do, Special Summon the targeted monster. You can only activate 1 "Vampire's Desire" per turn.